The late author of this beautifully written, well- organized biography was the older sister of the subject. 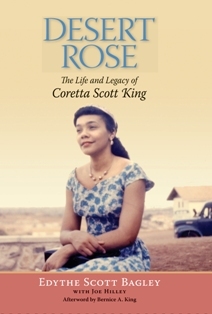 As noted in the Preface, the project began several decades ago, at Coretta Scott King’s request. On Thursday morning, April 4, 1968, Edythe Scott Bagley put an initial draft in the mail to a publisher. Later that day, her brother-in-law and the husband of Coretta, Martin Luther King Jr., was shot and killed. Publication of the manuscript was delayed, and eventually canceled. Many years later, in 2004, Coretta asked Edythe to take up the project again. Divided into five sections, SOIL, SEED, BUD, BLOSSOM, and FRUIT, the book has a total of forty-eight titled chapters, in addition to the Preface and Afterword.